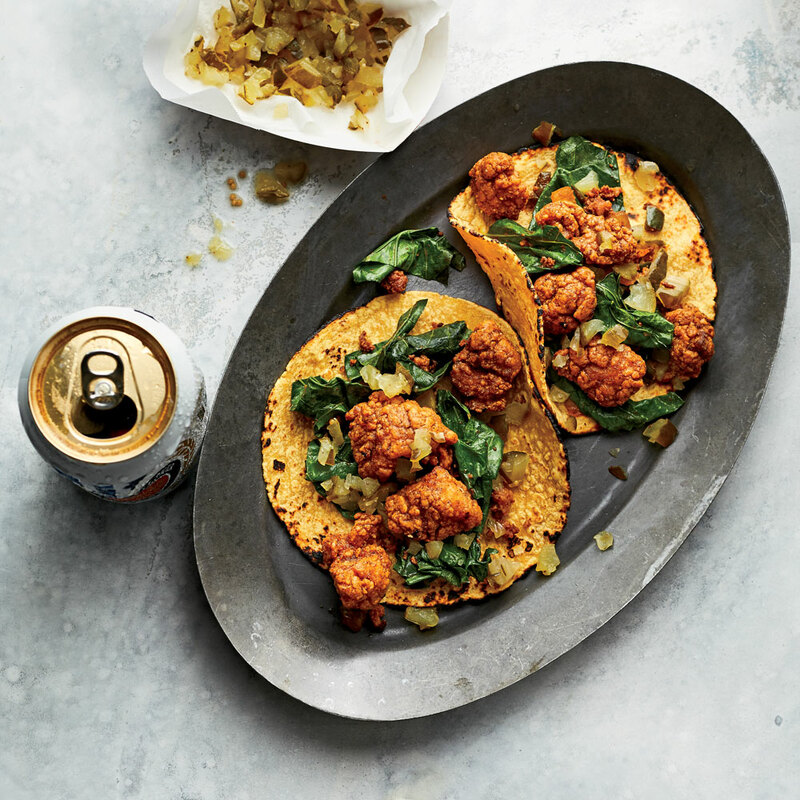 At Goodnight Charlie’s, a honky-tonk bar in Houston run by master sommelier David Keck, chef Felipe Riccio’s crispy hot chicken tacos are the perfect snack to fuel late nights on the dance floor. Riccio likes to top them with spicy, chorizo-studded braised collards and bread-and-butter pickles. Use the best-quality corn tortillas you can find, such as those from Masienda brand. Meanwhile, place chorizo, onion, and jalapeño in a large skillet over medium. Cook, stirring occasionally, until chorizo is crumbled and browned and onions are softened, 8 to 10 minutes. Add greens and 1 teaspoon salt; cover and cook until tender, 3 to 4 minutes, stirring once halfway through. Stir in vinegar. Remove from heat. Preheat oven to 200°F. Heat 1 inch of grapeseed oil in a large, heavy, high-sided skillet over medium-high to 360°F. Working in 3 batches, fry chicken, turning occasionally, until crispy and cooked through, 4 to 5 minutes. Transfer to bowl with spiced oil; toss to coat. Lift chicken from bowl; place on a wire rack set in a rimmed baking sheet. Sprinkle with 1/2 teaspoon salt. Transfer baking sheet to preheated oven to keep warm. Repeat procedure 2 times with remaining chicken and remaining 1 teaspoon salt.